Los Tweens was provided accommodations and tickets to enjoy the Disney World Parks. However, all opinions expressed are our own. I have a family of five – two adults and three children – this poses a big problem when we travel. Most hotel rooms have two queen or double beds. Suits with pull-out sofa beds cause arguments between the kids as to who is going to sleep on it. Then there is one TV and everyone argues. Or, if we are lucky enough to get two TVs there is no separation and you have competing sound between the television sets. I was pleasantly surprised and thrilled that the Walt Disney World Art of Animation resort in Orlando, FL solved this problem for us and more! 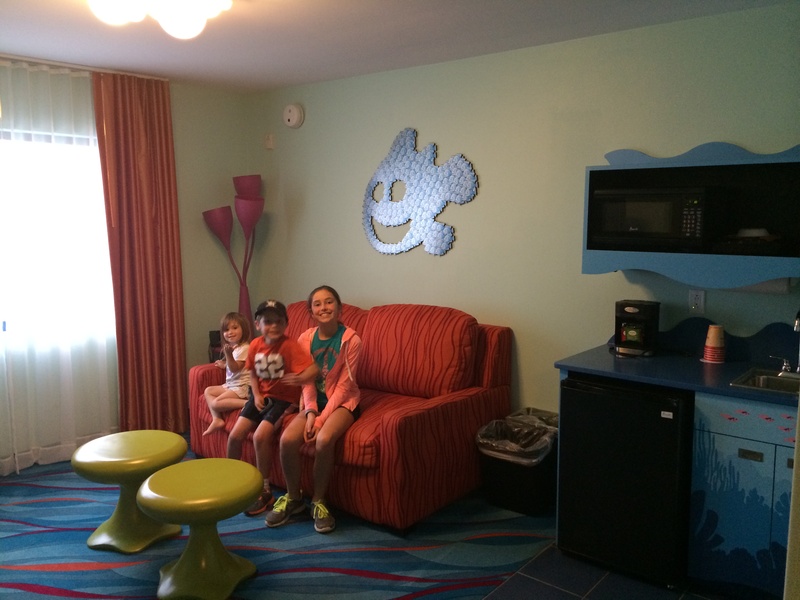 The Art of Animation Resort features “Family Suites” and they are definitely perfect for a family. The suites have a bedroom with a queen-size bed and an adjoining bathroom. We stayed in a Finding Nemo room and while the room was decorated in bright Nemo colors I was thrilled to find the adjoining bathroom to the bedroom to have a more neutral theme. The shower is often my refuge so having a large walk-in glass shower was truly appreciated! The suite then has one double-size sleeper sofa in the “living room” area and a double-size murphy bed. There was plenty of room for the kids and comfortable enough so they didn’t have to fight. The murphy bed transforms into a table during the day which is perfect for eating meals in your room from the on-site cafeteria or having a quick snack that you whip up in the kitchenette. I was truly appreciative of the kitchenette which had a sink, microwave and mini-refrigerator. We could easily store the toddlers milk, leftovers that the kids didn’t eat and bottles of water. I could wash the sippy cups in the sink and heat up leftovers in the microwave. Really perfect for our family! There is another bathroom with a tub that worked perfectly for the kids’ baths and allowed us to have a bit of privacy. The Art of Animation Resort is expansive but everything is well-situated. The resort has 3 pools, the Finding Nemo “Big Blue Pool”, the Cars “Cozy Cone Ppol” and The Little Mermaid “Flippin Fins Pool” PLUS the “Schoolyard Sprayground.” We were there in April and it was still a bit cool so we didn’t go in the water but there were many families that looked like they were having an awesome time. Like the other Disney resorts, Art of Animation Resort plays nightly movies in the pool area which is a lot of fun for the kids. There are also two playgrounds and an arcade on-site. The resort also has a jogging trail for those that didn’t get enough exercise at the Disney parks. We found the Landscape of Flavors, the on-site cafeteria, perfect for the picky eaters in our family. From pasta to burgers, salads and menus that changed, we were able to dine on-site often and find something that everyone was happy with. And of course just like the other Disney resorts, the Art of Animation features direct bus service in and out of the Disney parks. Welcome to Disney’s Art of Animation Resort! First off, if you have a large family you are going to be thrilled with all of the space. You’ll appreciate the in-room amenities and the accessibility to the pools and Disney parks. An added bonus to the resort was the staff. We had a sick child one night and the staff could not of been nicer with helping us. Every was helpful and understanding of all of our requests. 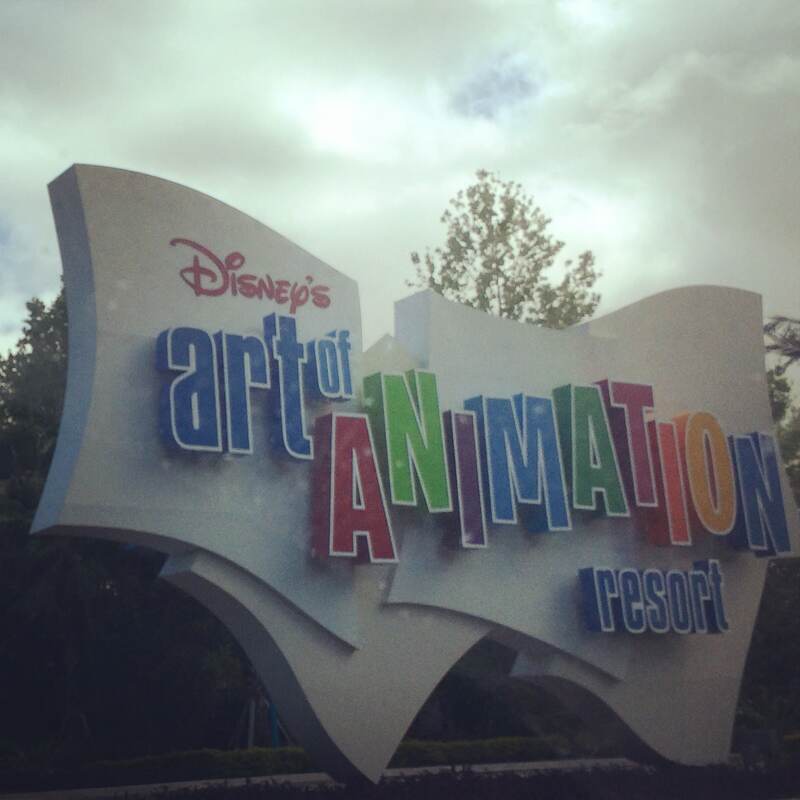 For more information on the Disney World Art of Animation Resort click here. 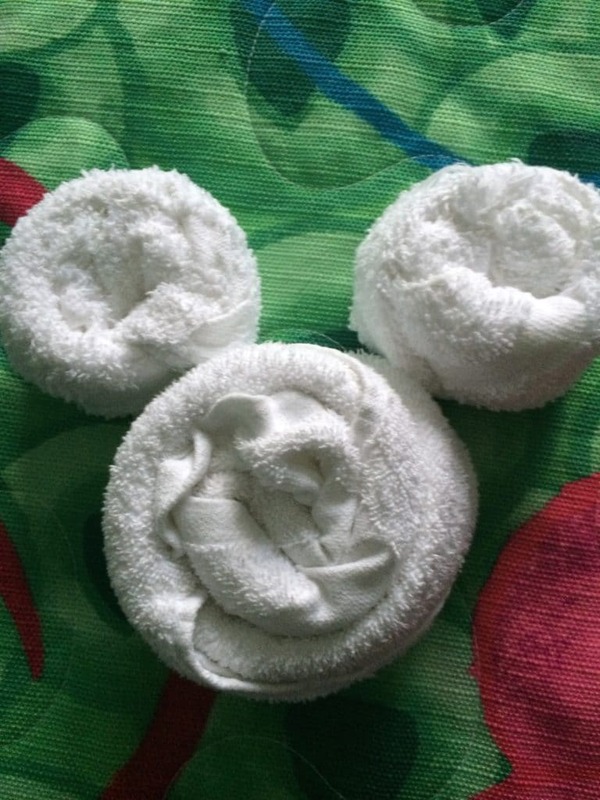 This entry was posted in Product Reviews, Travel and tagged Art of Animation, Disney, Disney World, Florida, Orlando, travel. Bookmark the permalink.